To file a worker’s compensation claim, individuals need to file the claim through the employer. This claim receives filing through the employer's insurer. Two other methods may be in use to file a claim as well. This includes filing a First Report of Injury form online, at the agency's website, or completing a First Report of Injury Form and mailing or faxing it to the company. The employee, the employer or a medical provider on behalf of the employee, may file the claim. Hourly fees and maximum caps depend on whether the Injured Worker prevails and the level at which the case was resolved. At Administrative Hearing level the cap is $4,620 and at the Supreme Court level the cap is $9,356 with different levels of resolution in between having different maximum caps. 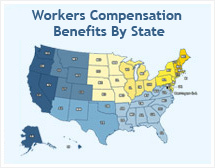 North Dakota workers compensation benefits are dependent on the injury and the type of employment. For Temporary Total Disability, where a doctor does not allow you to work for at least five days in a row, you will be paid a wage replacement, plus up to $10 per week for each dependent child. For temporary partial disability, where a doctor has placed limitations, individuals will receive up to 90 percent of their gross weekly pre-injury wages. For permanent total disability where you are totally disabled and unable to work again, a settlement will happen, based on the circumstances. All medical costs required by a doctor will receive coverage. All Employers may select a designated medical provider. Employee may opt out and choose a different provider in writing and prior to injury. The waiting period for compensation benefits after the injury is 4 days. Compensation is retroactive if disability continues for 5 days from the date of injury. NOTICE: These questions and answers concern North Dakota law only, and should not be construed nor relied upon as reflecting the law in other States, nor as giving legal advice. You are warned that circumstances often vary greatly and that, due to changing decisions and law, the answers to these questions may change over time and not be current, and you should consult an attorney in any specific case, and NOT rely on these questions and answers as giving anything other than general information.